Just a mad dash through to mention that the report is now up on the second Laydeez Do Comics meetup with illustrations done by Paul Sheridan is up including a bonus photo in the slideshow of me with crazy eyes. Our guests, Sarah Bracken, Paddy Lynch, and Arja Kajermo were all wonderful. You know what else is wonderful? Seeing a little zine and indie scene grow in Dublin and throughout Ireland. Coming from America, I take zines and indie comics for granted, but here, they’re still very much underground and very much unknown by most people. One of the most heartening things about the zine scene is how much people are still interested in the time-consuming endeavor of making and publishing tactile objects as opposed to just putting things online. I love the Internet and the way people can more easily communicate with others about their interests but I love hardcopy books and zines and comics as well, and it’s wonderful to see them thriving. Details will be coming in October about the next Laydeez Do Comics meeting, so stay tuned! First thing: The next meeting of Laydeez Do Comics Dublin will be on Wednesday, September 11, 2013 at the Odessa Club at 7 PM. If you like or do comics, zines, illustrations, or just enjoy interesting and engaging talks, please join us! Second thing: Maura McHugh and I were interviewed about Laydeez Do Comics by Liam Geraghty of The Comics Podcast. There are lots of other interesting topics discussed there as well including the documentary Wonder Women: The Untold Story of American Superheroines, which I saw last month here in Dublin and highly recommend even if you are not a Wonder Woman or superhero(ine) fan (I am neither). Third thing: Always wanted to visit Ireland? Here’s your chance. How does a pre-bid announcement to hold the World Science Fiction convention in Dublin in 2019 sound? The inaugural meeting of Laydeez Do Comics Dublin, which I announced a couple of weeks ago, was on Wednesday night and it was a roaring success! You can see photos and read a report of the event here and Róisín Curé drew throughout the evening to produce this charming illustrated account. Thanks to engaging presentations by Sarah McIntyre, Alan Nolan, and Maeve Clancy, this also turned out to be a really well-rounded event that had something to offer not just people interested in working in comics but fans of the form as well as creatives in most professions. We were also fortunate to have a delightful audience and a great venue, the fabulous Odessa Club. And C.E. Murphy brought the most amazing ginger snap cookies I’ve ever had the good fortune to taste, so really, what more could we have asked for? We’ll be arranging another meeting in a few months’ time, probably in September, so watch the skies! Well, and the internet. My fellow writer Maura McHugh and I have been working on a project I’m very happy to announce at last–the establishment of a branch of Laydeez Do Comics in Dublin. 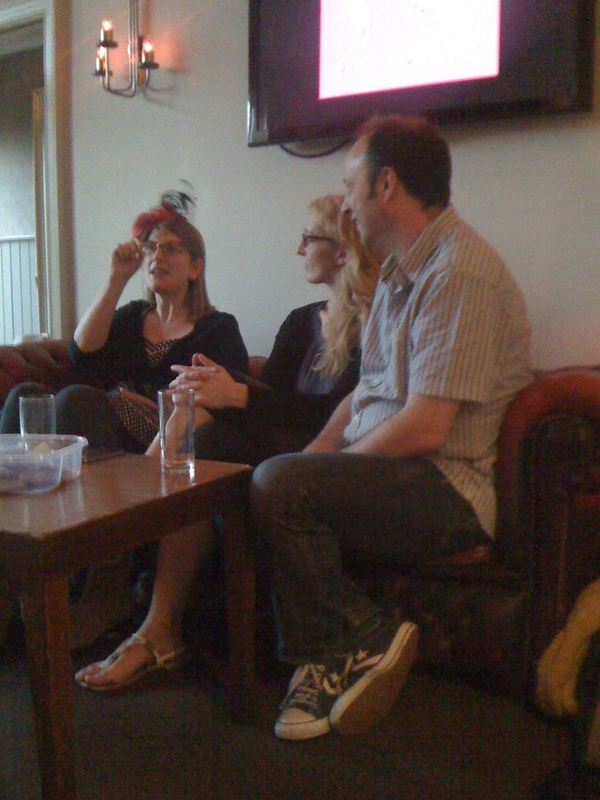 Laydeez Do Comics began as a forum in London in 2009 and has become a network of meetings across the US and UK in such cities as San Francisco, Glasgow, Brighton and more. It is not women-only, though it is led by women. Our first meeting will be on Wednesday, May 22 from 7 to 9:30 PM in the Rooftop Bar on the top floor of the Odessa Club, 13 Dame Ct., Dublin 2, and our first guests will be Sarah McIntyre, Alan Nolan, and Maeve Clancy. The event itself is free. We’ll be asking for a donation of 3-5 euros just to cover costs. I’m really excited about this, and if you live in Dublin and are an artist or writer and/or have an interest in comics in any way, I hope to meet you there!